Makah culture centers around family, tribal ceremonial tradition, the sea and distinctive native art. You can learn more about this centuries-old culture by visiting the Museum at the Makah Cultural and Research Center, and by attending Makah Days, which is held each year on the weekend closest to August 26th. The northwest coast of the Olympic Peninsula teems with wild life. The dense forests, sparse human population and abundant rainfall provide excellent habitat. There are several large elk herds close to Neah Bay. Deer, bear, cougar, coyote and bobcat are common. Less seen, but hiding in the undergrowth are smaller animals such as river otter, muskrats, and raccoons. 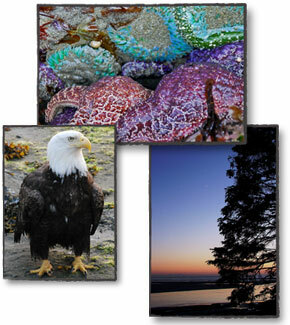 The sandy beaches and rocky tide pools that surround the Makah reservation abound in sea creatures. On the ocean side, olive snails are harvested by Makahs to be used for traditional jewelry and ornaments for dance regalia. Tide pools are the home of sea urchins, sea anemones, sea stars, starfish, sand crabs, hermit crabs, bullheads and a host of sea snails. Adults and children both enjoy turning over rocks or piles of beached bull kelp and seeing critters scurrying for hiding places. Be sure to bring your nature books along so that you can identify what you see. Help us and the next generation renew their commitment to preserving this fragile costal environment. The Makah Indian Reservation has 44 square miles that are bordered by the Pacific Ocean and the Strait of Juan de Fuca. It offers rocky shoreline, sand dunes and offshore islands to many species of birds. The coastal forests, lowland valleys and wet meadows also attract many nesting, wintering and migrating species. Neah Bay is a Mecca for sports fishermen. With its excellent moorage, access to the straits and ocean without going over a river bar, and variety of Coast Guard certified fishing charter operators you are assured of the best possible chance of having a memorable experience! Salmon, halibut, ling cod, and a variety of rock fish await your bait. The Neah Bay area has many trails and beaches for hiking. The three most famous trails are to Cape Flattery, to Shi Shi Beach, and the trail from Lake Ozette to the Pacific Ocean. If you are a strong hiker, or a hiker that appreciates an easy trail with beautiful scenery, you will be thrilled by what you find here. With miles of coastline, containing kelp forests, sea caves, islands, sea stacks and pristine beaches, Neah Bay is a paradise for kayakers. You can lose yourself in this aquatic wilderness for a week and still not explore all its wonders. Neah Bay is located on the land boundary of the Olympic Coast National Marine Sanctuary. You can take your own boat into the sanctuary, or you can book a tour with one of the several charter fishing businesses which offer marine tours. Check the Sport Fishing page for a listing of those who offer tours. The pictures on this page are representative of what you may see in the waters off Neah Bay. Many sports fishermen see these sights as a bonus to their fishing experience. Neah Bay is located on the very tip of the Olympic Peninsula, where winter storms often strike with gale force winds and torrential rain, leaving forests littered with downed trees. Storms on coastal waters and shorelines are awe inspiring. Huge waves batter the beaches and wash up piles of shells and debris. Species of birds normally seen off shore move into the relative shelter of the Straits. Once you have experienced these storms, hopefully from the safety and warmth of lodging overlooking the water, you will never forget their wild beauty. Neah Bay shores are ideal for a variety of water sports. In the summer Hobuck Beach attracts surfers and kite boarders. In the winter surfing moves to the relative shelter of the beaches around the corner inside the entrance of the Strait of Juan de Fuca. Neah Bay is also known for its beautiful under water scenery. Scuba divers come from all over the Northwest, and from many farther locations, to enjoy clear waters and abundant sea life. The Makah National Fish Hatchery is located a mile from the Pacific Ocean, near the Shi Shi Beach trail head. Chinook and coho salmon are raised, along with steelhead. These are released into the tsoo-yas and wa atch rivers, which flow through the reservation, into the Pacific Ocean. The fish spend between one and four years at sea before returning. Visitors can watch the fish climb the hatchery's fish ladder into the holding ponds.